Preheat oven to 180ºC and line a standard slice tin with baking paper. Over a very low heat melt butter, dark chocolate and cocoa gently in saucepan. When well combined and smelling all chocolate like, stir in the dark brown sugar and vanilla. Take off heat, add spices and stir well. Sift in flour and mix well. Add in the eggs and beat on med/high for 2 minutes. Add dark chocolate chunks and stir through. Pour into lined slice tin and bake 20-25 minutes. You'll know it's done when the top slightly cracks and a toothpick comes out mostly clean. Sprinkle with icing sugar for easy prettiness if needed. 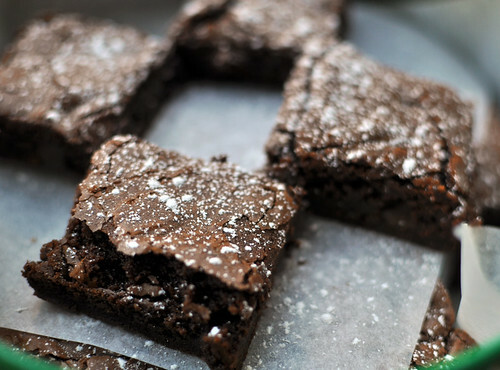 *adapted from suzie's classic and amazing brownie recipe. Oh. My. GOD. Leslie. I need to get home and bake these - they sound amazing. Thanks for sharing.